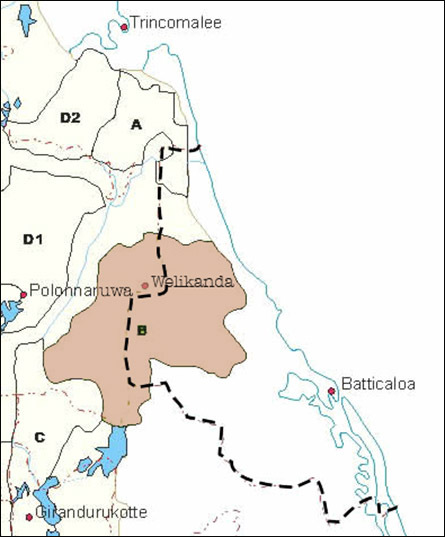 Sinhala colonists from Polonna'ruwa, the home district of SL President Maithiripala Sirisena, have advanced 3 km further into the pasturelands in Koara'laip-pattu South (Kiraan) division of Batticaloa district in the occupied country of Eezham Tamils within the last 12 months, Tamil cattle farmers from Chiththaa'ndi told TamilNet on Wednesday. A second Buddhist temple is being hurriedly put up by the Sinhala colonists at Maathava'nai , the Tamil cattle herders said. A Sinhala squad, led by a Buddhist monk, assaulted the Tamil farmers who went close to the Buddhist temple searching for missing cattle a few days ago. The Sinhala monk seized their mobile phone SIM cards. The cattle herders said the second Buddhist temple is located 3 km east of the Buddhist temple constructed almost a year ago. 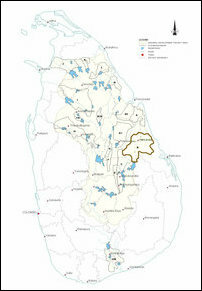 The area was part of the de-facto Tamil State defended by the Tamil Tigers until 2007. Hailing from Polonnaruwa, SL President Sirisena has been implementing a long-term Sinhalicisiation agenda within the so-called System B, which is the largest of Mahaweli ‘Development’ programme, consisting of 75,441 ha., including 27,179 ha of irrigable lands in Polonnaruwa and Batticaloa districts under the pretext of ‘development’. Tamils agricultural lands, pasture lands and forestlands are being seized for settling Sinhala colonists in the seized lands. SL President Maithiripala Sirisena’s so-called Mahaweli ‘Development’ Ministry is behind the structural genocide against Eezham Tamil dairy farmers by stepping up the Sinhala colonisation. The Secretary of Dairy Farmers Association in Kiraan and Chengka'ladi, Mr Nimalan Kanthasamy, who was interviewed last week by TamilNet said more than 1,000 hectares of forest and pasture lands have been recently seized. Retired Sinhala military men, armed ‘home guards’ paramilitary, Sinhalese traders from the South, Buddhist monks and poor Sinhala daily-wage labourers were being deployed in seizing the pasturelands, according to Nimalan Kanthasamy. The big-scale seizure of pasturelands is taking place at Mayilaththa-madu and Maathava'nai, Koa'ra'laip-pattu South division, where several thousands of acres have already been seized by the encroaching Sinhalese. Already by May 2015, more than 12,000 acres of pasturelands had been seized in Maathava'nai area in Kiraan DS division alone, according to the figures provided by Mr Karthirgamathamby Kurunathan, a retired Land Commissioner of the Eastern Province. The cattle farmers, who have been protesting for the last 3 years against the seizure of lands, intensified their campaign in May. Although the civil authorities promised action against illegal settlers, the seizure of lands has in fact been accelerated on the ground, the farmers said.